The infrared thermometers are a great way to detect the temperature with a variety of household and work objects. Its energy sufficient light beam qualities allow the users to point at any object and quickly detect the temperature . Use it when you are cooking and barbequing, performing auto maintenance, doing home repairs, and a host of other tasks. 1) Infrared thermometers only measure the surface temperatures and not the internal temperature of food or the other materials. 2) Infrared thermometers can be temporarily affected by rapid changes in the ambient temperature. The LCD(Liquid Crystal Display screen is backlit, also has an Auto-Off function to extend the battery life, and features a low battery indicator so you never accidentally run out of juice (battery included). Non-Contact: The Infrared lens inside provides temperature readings without touching or coming close to anything dangerously hot or cold. Simple to Use: Just point it at the object, press the trigger ,temperature will appear instantly. Laser Guided: Aim precisely at whatever you measure thanks to the laser beam guiding the way. Temperature Range: -50°C to 380°C(-58°F to 716°F). Adjustable Emissivity : Make the test more accurate by adjust suitable emissivity for different articles. If you have any questions about this product by Magicoo, contact us by completing and submitting the form below. If you are looking for a specif part number, please include it with your message. 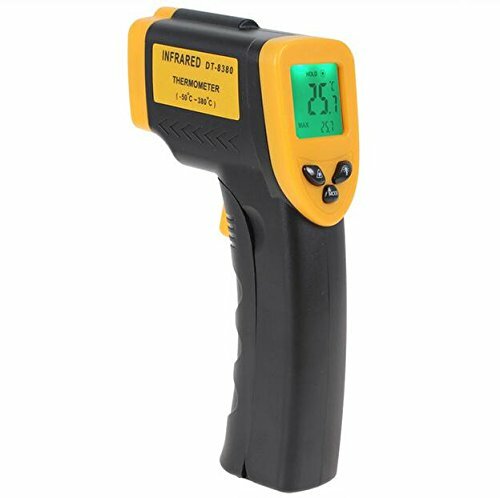 Infrared Thermometer IR Laser Thermometer Non-Contact Digital Temperature Gun -32°C~380°C (-26°F~608°F) Instant Read with Auto Shut-off Data Hold Function, LCD Backlight Display, Battery Included.